Impossible is nothing with this technology, only your imagination and ethical standards set the limit. CRISPR/Cas9 allows you to modify the genome exactly where and how you want, with only two reagents: Cas9 and gRNAs. Now, molecular surgery is possible! Clustered Regularly Interspaced Short Palindromic Repeats (CRISPR), also called RNA-Guided Engineered Nuclease (RGEN) is a revolutionary genome editing technology that has come to stay. It was in 2013 when an article in Cell journal described for the first time this rapid, accurate and efficient technique of genome editing. Since then, this technology is trending topic and the two researchers who have started this revolution, Dr. Emmanuelle Charpentier and Dr. Jennifer Doudna, are constantly being awarded. It is a directed mutagenesis strategy based on a bacterial immune system (one of the first discoverers of the CRISPR was Dr. Francisco Juan Martínez Mójica) which allows a highly efficient in situ edition of genome specific loci, enabling the molecular surgery. This is a very simple system in which the targeting depends only on a very easily customizable guide RNA (gRNA) that targets the nuclease (Cas9) to specific endogenous genes. Thus, genome editing is mediated by RNA-DNA interactions, using simple base-pairing rules between the customized gRNA and the target DNA. The high efficiency, the simplicity and the low cost make this genetic engineering platform a powerful tool for biological research. CRISPR/Cas9 system allows for generating indels, large chromosomal deletions or rearrangements, subtle mutations, full and conditional gene knock-outs, knock-ins, chromatin modifications, multiplex and biallelic mutations and even for gene expression regulation. Thus, this revolutionary technology has multiple applications such as the production of animal models of diseases, functional and drug response studies or gene therapy. This genome editing technology can be applied in a wide range of cell types and organisms. 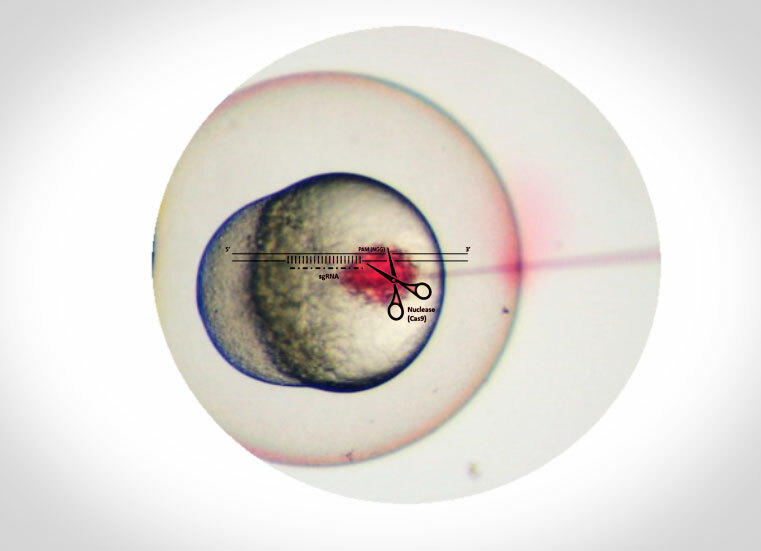 In our laboratory we are using the CRISPR/Cas9 in mammalian tumor cell lines to get cells with high metastatic activity and cancer stem-like cells in order to characterize them and the molecular mechanisms involved in this fatal stage tumor development. We also intend to use this genomic editing technique in Zebrafish to get transgenic tumor models to carry on in vivo studies and to provide new knowledge in the oncology field to offer more hope to the many people suffering from cancer.